High Speed Oblique Type Paper Corrugating Machine is gaining high popularity among customers due to its excellent production capacity and increased efficiency. The Rolls of our High Speed Oblique Type Paper Corrugating Machine are mounted on roller bearings for smooth running and longer operational life. It is provided with gum tray movement device, which becomes operational when gum unit is disengaged from rollers. It also comes with centralized lubrication system. 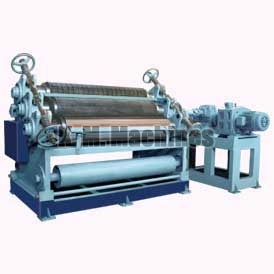 We share glorious credentials in the list of top Manufacturers, Exporters and Suppliers of High Speed Oblique Type Paper Corrugating Machine from Punjab, India. 42" 7.5 300 5 7.0" x 16"
52" 10 300 5.5 8.5" x 16"
62" 10 400 6 9.5" x 16"